The brains of the system, all Sundial storage systems need to start with the master unit. 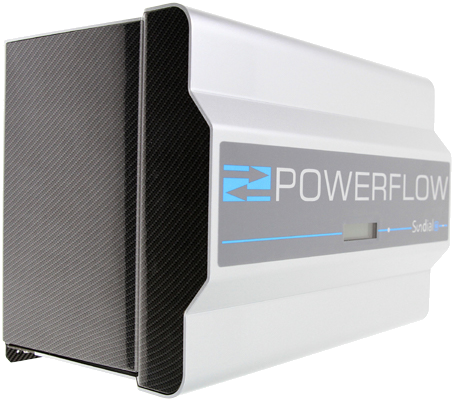 This 2kWh unit can be used as a standalone battery, or as the start of a larger storage solution. Automatically capturing and storing surplus energy and compatible with any Solar PV system the Sundial is easy to integrate and quick to install thanks to its Plug and Play technology (PowerFlow SPEEDFIT). Easily expandable, the modular system can be increased in blocks of 1kWh or 2kWh using Sundial S (up to 96.0kWh), all without affecting any Feed-In-Tariffs. The Sundial is a safe battery, using Lithium Iron Phosphate (LiFePo4) as well as an extremely advance battery management system. This ensures that there are no high DC voltages in the system. The battery chemistry is long lasting, and comes with an extensive warranty of 10 years or 6000kWh. This battery is now fully G100 compliant, allowing for the fast track of G59 applications (this can be dependent on the DNO).